The trail mix is great (I'll share the recipe below) but we needed something else for him to snack on as well. With all the other kids around him eating packaged sweets, the boy needed something, anything, to help his sweet tooth. A couple Christmases ago, Katie received a mini donut making machine as a gift from “Santa Claus”. That might have been more than a couple years since high schoolers don't get visits from Santa Claus … LOL Anyways, we have this donut maker and being “paleo”, well, we don't eat donuts anymore. We did a little research and found a cinnamon raisin bagel recipe online. All it needed was a little paleo juicing up!! Rather than fire up the oven on these still hot August nights, we decided to use the donut machine to make California Raisin Donut Bagels, or “California Raisin Donagels”. I made sure to purchase “California Raisins” in the box at my local grocery store. This variety of raisins are easy to find in stores as they are marked as “California Raisins” right on the package. And check this out – California Raisins are the most economical dried fruit (according to the USDA) and have zero fat, no cholesterol and no added sugar!! Raisins are naturally sweet so there was no need to add sugar for sweetness AND this makes this dish even more paleo friendly. California Raisins are an all-natural, dried-by-the-sun fruit you can feel good about sending with your kids as they head back to school or offering as part of an after-school snack. The ingredient list on the box says it all: Raisins. How often do you see that these days?? Plus, raisins offer 9% of your daily fiber and potassium, and 6% of your daily iron (per quarter cup serving). I bought both golden raisins and the classic raisins to give this recipe a little more interest and we set about converting the recipe to be “paleo-friendly”. Raisins are naturally sweet so there was no need to add sugar for sweetness AND this makes this dish even more paleo friendly! Preheat the Oven the 350 degrees. Combine all of the dry ingredients and mix well. Combine all of the wet ingredients and mix well. Add the wet ingredients to the dry, mixing well. Heat donut maker and grease lightly with Coconut Oil to prevent sticking. Spoon mixture into the sections of the donut maker and cook for 8 minutes. 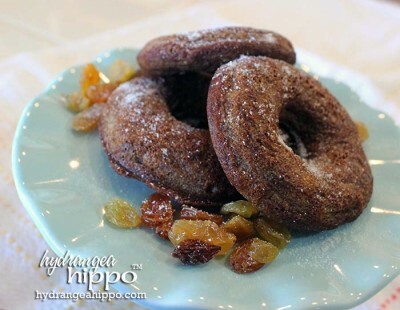 Remove the "donagels" from the donut maker and allow to cool. 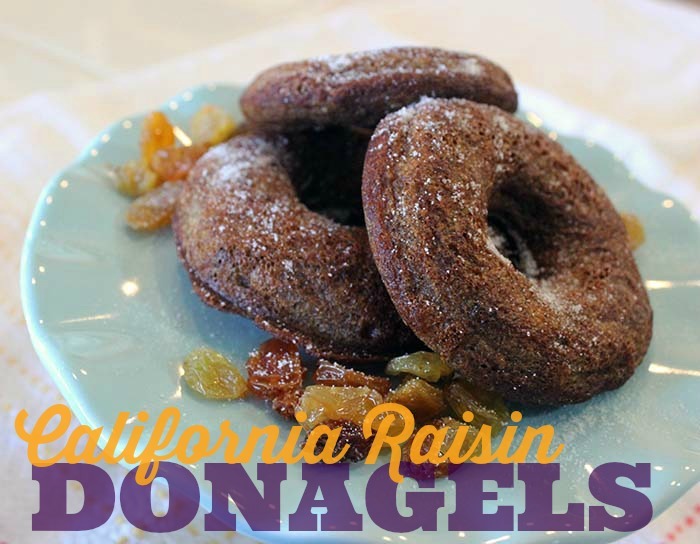 You can add powdered sugar to top the donagels but they're already really sweet from the raisins. Visit www.loveyourraisins.com for more information about California Raisins and find California Raisins on Facebook at facebook.com/californiaraisins where you can sign up to receive a California Raisins prize pack! Limited supply; while quantities last. Now, go dust off that ole donut maker and create some healthy snacks for the kids with California Raisins! For more paleo snacks and recipes, check out my other blog, Paleo Priests. Subscribe to our newsletter and follow us on Facebook for more crafty goodness! It started with jewelry, beading, sewing, home decor, painting, basket weaving, pottery, and cross-stitch. Marry that to an entrepreneurial spirit & at 9 years old a girl is selling her wares at craft fairs as far as her parents and grandparents would drive her. 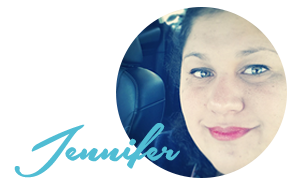 These days, Jennifer enjoys crafts of all genres from sewing to scrapbooking to jewelry with a little dabbling in the mixed media world. Her style is approachable and she wants everyone who sees her work to feel that they too can embrace creativity and make their home and life beautiful. I love how you have your recipe printable on here! It sounds so yummy!!! A must try for sure.